Our Bay Region microclimates are affected by topography and proximity to the coast and the bay. The coastal hills can affect summer heat and winter cold, moderating temperature extremes in those communities located west of the coastal range. Communities farther inland to the east, away from the coast and the bay, experience hotter summers and colder winters. 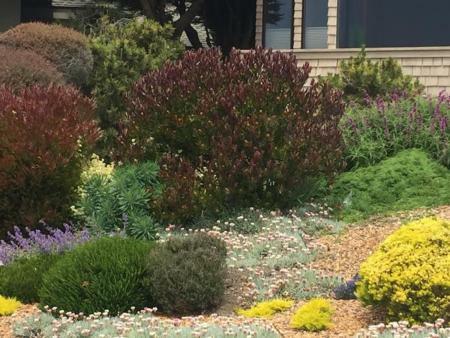 Plants that do well in coastal regions may suffer if planted in areas with winter frost or summer heat - even though these regions can be just a few miles from each other. The Sunset Western Garden Book, one of the most widely used references for plants grown in western North America, assigns regional zones to bay communities. Knowing your Sunset climate zone can help you pick the right plants for your garden. Most San Francisco Bay Regional zones are 7, 9, 14, 15, 16, and 17. In general, zones 15, 16 and 17 are considered coastal communities. Even within a small garden, climate can be affected by slope, structures, orientation and wind. A south-facing wall will radiate a lot of heat when the sun is out, whereas the area on the north side of your house will remain cooler and shaded for most of the year. Cold will “sink” to the bottom of a sloping hillside, creating cooler temperatures. Deciduous trees will allow winter sun to warm your soil, but they may shade out and affect the number of blooms on summer-flowering plants. Windy conditions may affect growth and increase water loss. Some plants grow well in just about any kind of soil, but most have a preference. Much of our native soil in the Bay Region is clay, composed of tiny, microscopic plate-like particles. Clay retains water for a long time, but drains very slowly. Plants that prefer good drainage should be planted on slopes or in soil that has been amended with compost to facilitate better drainage. Some plants like moist, rich soil – amended with lots of organic material to retain moisture like a sponge and offer a good supply of nutrients. Adding organic material to your soil can improve water retention in sandy soils, while increasing pore space for air and drainage in clay soils. 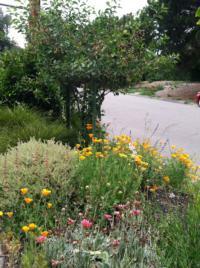 Plants that grow well in Mediterranean climates are accustomed to wet winters and dry summers. That does not mean that all plants can do well without supplemental water. In fact, many Mediterranean climate plants appreciate a few or several good soakings during the heat of summer and early fall. However, some plants can become drought tolerant so long as they are irrigated regularly and deeply during their first few years of growth. Overwatering can kill some plants. Many plants, if watered properly, require less water than you might think. Look for plants that require less than “average” amounts of water – moderate, occasional, or infrequent amounts – to stay within your water budget. Water is a precious resource in California, so invest in plants that will not break your water bank. When selecting plants for your garden, you have the opportunity to create a backyard ecosystem that attracts native insects, birds, and other animals. Try to select plants that offer a year-round food supply, such as pollen, nectar, seeds, and berries. Choose plants that offer nesting spaces and cover to protect against predators. And by adding a water feature, such as a recirculating fountain that also serves as a bathing spot, you will invite a host of birds and other wildlife attracted by the burbling sounds from your fountain. Your garden won’t just be a pretty picture; it will be a haven for wildlife and will enhance your viewing enjoyment.